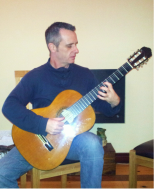 I am an experienced and qualified teacher with over 25 years of guitar teaching and 15 years music classroom teaching experience, who enjoys teaching beginners, through to preparing pupils for exams or college entrance. - studied classroom music teaching at Strathclyde University, then taught full time in a variety of different schools for the next 15 years. I am also a qualified Tai Chi, Chinese Dao Yoga, Meditation coach of Weihai Lishi Quanfa.